Summer Lullaby for Harp (Free) and Now a DUET! 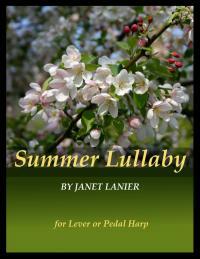 Song is also in a booklet "Lever Harp Solos for the Adult Beginner, Book I"
I am pleased to announce that Summer Lullaby is now being offered as a harp duet thanks to harpist, Barbara Ann Fackler of hornandharp.com, who wrote a second harp part for it! Barb has written an easy second part with no pedal changes that can be played on 22-stringed harps (C-c) or more. Go to her website HERE in the harp ensemble section, download the second harp part and grab a friend! If you would like the full score for this delightful duet, please contact me through my contact page. Do you have a small harp that doesn't go below middle C?